With a global online readership of 6.4 billion people and over 10.9 million coverage views and climbing, love for The Neely Air Mi Adidas TR-808 custom concept* has spread to the East. Created by Margo Neely, Hijacked Artist Management broke the story and lit the match that sparked a worldwide fire in the mainstream media. The still-growing viral phenomenon has appeared in major print and digital publications in the Middle East and Asia, landing full-page features in Stuff Middle East, Biglobe, Gizmodo, Playatuner, Yahoo, Midifan, MSN, Mixmag Korea, Cue N’ Play, T-Site, and Straatosphere. The innovative beat making shoes captured the imagination of the press and fans alike, disturbing the peace with an additional estimated engagement of 47 to 54 million across all social media channels. Margo Neely, creator of the Neely Air Mi Adidas TR-808 sneaker and Chief Creative Officer at Neely & Daughters, sought to pay homage to the legendary Roland TR-808 drum machine and the pioneers of Hip Hop with a 21st century twist. An influencer and innovator pioneering the crossover and amalgamation of creative and branding in the fashion, music, tech, and lifestyle spaces, Neely’s drum machine concept shoes represent the future of both wearables and effective marketing. Margo expounded on her role as a creative and the genesis of the Neely Air Mi Adidas TR-808 concept in exclusive interviews with Ask Audio’s Rounik Sethi and Matt Kennedy of Pod Sequentialism. To view the complete and unexpurgated press and metrics on the Neely Air Mi Adidas TR-808 sneakers, please visit our coveragebook. 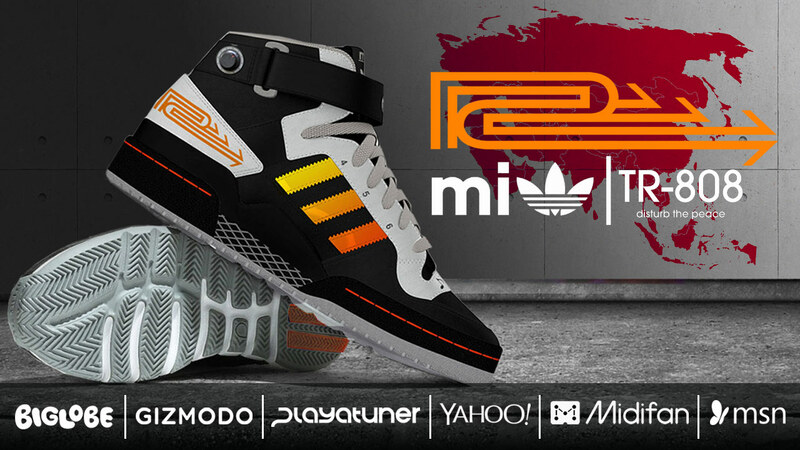 * The Neely Air mi adidas | Roland TR-808 custom concept was not solicited by and is not endorsed by Roland Corporation or adidas. It is purely an artistic concept.